Hannah Sullivan's debut collection is a revelation - three long poems of fresh ambition, intensity, and substance. Though each poem stands apart, their inventive and looping encounters make for a compelling unity. "You, Very Young in New York" captures a great American city, in all its alluring detail. It is a wry and tender study of romantic possibility, disappointment, and the obduracy of innocence. "Repeat until Time" begins with a move to California and unfolds into an essay on repetition and returning home, at once personal and philosophical. "The Sandpit after Rain" explores the birth of a child and the loss of a father with exacting clarity. 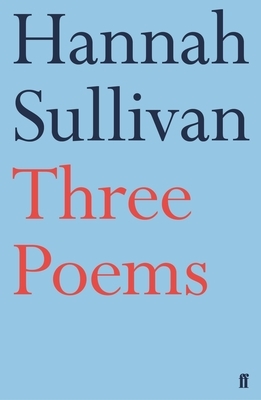 In Three Poems, readers will experience Sullivan's work with the same exhilaration as they might the great modernizing poems of Eliot and Pound, but with the unique perspective of a brilliant new female voice.